I welcomed the New Year in what might be an untraditional way (mostly alone, albeit communicating with people far away), but I made sure to do it in the company of strangers. In addition to witnessing the buildup of the countdown, cheers, well wishes, and dancing (to ABBA, of course), I have also been settling in with this project. I'm quite pleased with how it's turning out, even if I had envisioned being farther into it by the beginning of 2012. You have meant so much to me this year, and I look forward to spending 2012 with you. 1. Sleep until heart's content. 5. Spend too much time on the internet. Haven't done a lot of reading. Haven't done a lot of shopping. Haven't done a lot of knitting, frankly. But I did make a zine. I did buy a new shirt, vest and tie for tonight. And I have made some preparations for a 12-hour songwriting marathon tomorrow. 1. Missed out on a drag show. Fortunately, I got to say hi to all the friends who were on the correct continent and could be there. 2. Knit, and was pleased. 3. Watched Make the Yuletide Gay (and knit). Pretty cute. Even the Minnesota/Wisconsin accents. 3. Visited the bank, about half an hour too late to do everything I needed, but it did allow me to buy groceries. 4. Between the bank and groceries, I sat around and was mopey for a while. 5. Came home, cooked myself a dinner of pasta with ground turkey and broccoli, and started watching Merlin. We can blame all future interest in Merlin on the fearsome bowler. For the last few years, I've tried to make a habit of posting five-item lists each day during the month of January. Since I seem to usually lose steam during week three, and I just started a two-week break from work, I figured I'd start the tradition a little early, and use it to add a little structure to my giant window of unscheduled time. This weekend has been my first Christmas away from home, and so a new experience. However, because it isn't Christmas in Russia until 7 January, it doesn't feel very much like Christmas. I know it is on a conscious level, but I don't feel it very strongly here. 1. Discovered the excitement that is Virtual Choir 3.0. Downloaded and began learning a voice part. 2. Acquired yarn and needles for a hat I promised to a co-worker. It was super foggy in Vgrad. 3. Ate a pizza from the street stand that I've been intending to patronize for months now. 4. Left my cocktail selection up to the bartender, which resulted in three very different, interesting, and sugary drinks. 5. Knit and watched Love, Actually, intermittently chatting with Amoeba. 1. Woke up and was promptly invited to a puppet show, which was fantastic. 2. Finished my co-worker's hat. 3. Bought a grey and purple striped sweater. Thin, but very warm. 5. Talked to my family, and was thankful: I have no idea how people lived abroad or navigated long-distance relationships pre-Skype. "Just don't worry; worry ruins your knitting." ...I am thankful for some wonderful people! We have learned this week that large envelopes move through the Russian postal system FAR quicker than packages. According to the package experiences of others, when my friend put a generous assortment of zines in the mail in early November, I expected to see them in early January, at the earliest. Boy, was I surprised this week. Aside from the sweater and zine highlights, it's been a rough week here. It's been a busy and stressful one at work, and I've been thinking a lot about a couple of friends/families that are dealing with some tough stuff right now. I'm oscillating between keeping my thoughts with those folks, and thinking about being far away from my family as the holiday season starts. To top it off, Friday night decided to make itself into an aggravated little monster. I'm incredibly lucky, though, and I try really hard to not lose sight of that. I've been blessed to catch up with a few friends this past week. I'm also talking to this human whenever I get the chance, and those conversations, in all their 6000-mile width, make everything so much easier. I'm wide awake, and my mind is completely occupied with being a verbose and angry queer, but really, there is this sweater, and I've been meaning to tell you about it all week, and since I'm up and typing, I figure I might as well bang this post out. Well, there isn't a sweater, so much as there is some yarn and an idea. And it isn't so much an idea, as much as it's a well-formulated plan that's been kicked about in my brain for, oh, two and half years now. The difference this time is, I'm actually excited about it. It all starts with this completely other knitting project. I finished a lace shawl a few weeks ago (Vernal Equinox in Iskra). I needed a new project that wasn't the socks I'm inexplicably avoiding, and the mittens I made only kept me occupied for a week. I organized my stash, pored over the lace patterns I currently have access to, and settled on the Firmaments Lace Shawl in Lidiya. It was a little fiddly at the beginning (as it seems most circular shawls are), but since it starting filling out the center of the needle, it's been lovely. The needles are my new favorites: my Addi Lace needles, size 4. I love, love, love my Addi Turbos, but the plastic cable in the lace ones means I don't have to worry about accidentally kinking the cable, like I do with the metal ones. Of course, almost immediately after casting-on, I began thinking about this sweater. Three years ago, during my last year at Oberlin, I bought this yarn. I had used another colorway to make my dad a scarf for Christmas, and had been drooling over the rest of the skeins since. When I graduated, my knitting circle companions presented me with a gift certificate to Smith's, Oberlin's yarn shop (and the site of our knitting circle). 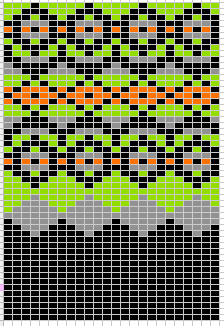 I took home the green and dark brown, made a swatch, having planned a simple colorwork pattern to be knit up on 5s and 6s. When I got home to Minnesota, I bought a couple of other colors (the tan and orange) to supplement my yardage. The plan was to knit an Elizabeth Zimmerman seamless yoke sweater. I swatched and started knitting. Thankfully, reason stepped in (or rather, tried on the first few inches of the body), and pointed out that this yarn was 100% alpaca, and that alpaca tends to lose it's shape easily (and also that ribbing was a terrible idea and that I had cast on too many stitches). I decided 5s and 6s weren't going to cut it. I agonized for a long time. I had had, in the past, clothing turn out to be far less satisfying than I expected, and this project had some pretty high expectations. Over time, I became afraid that this yarn was doomed to be a disappointment. I set the yarn aside, and it sat for at least a year and a half. So when I was struck with this sudden optimistic enthusiasm to pick this project back up, I knew I needed to jump on it. The only problem: I had decided, for shape-holding purposes, to knit the project with more colorwork and on a smaller needle. I knew I couldn't take the needle size down too far, but I had settled on 3.5mm circulars. Which is a US 4. Precisely the needles I had just used to cast on a 1700-yard shawl. Clearly, as most knitters know, the answer was to buy a new needle. I went to the local yarn shop by work, and inquired about the Addis they had in stock. Sadly, they were low, but they told me they expecting a shipment soon. I came back the afternoon of the shipment (last Thursday), but was disappointed. At the weekend, I found another shop that carried some cheap circular needles, which will suffice. I brought them home, and knit (and blocked!) myself a swatch. I'm still waffling a little on the size, since I'm aware that the parts with colorwork will have little give, and the parts without will have a lot, which means I haven't cast on yet. 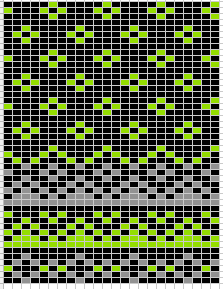 I've mostly been doing a lot of math and calculations and rewording the pattern. I'm inverting EZ's technique for this one. Since the smaller needle size and increased colorwork has me worried about running out of yarn, it seems the logical answer is to start at the neck, instead of at the hems, and we'll see how long the arms get in the end, and how much detail we can insert on the body. PS. These are definitely adapted from an Alice Starmore pattern book.